Brand new Turning Machine is runned from DE’s LFO and modulating back all parameters of the DE. Sorry for video quality. I still use DV camera and spend my money on modules. This entry was posted in Video and tagged Dark Energy, Doepfer, eurorack, Music Think Modular, Thonk, Turing Machine, video, demo, modules, desktop modules on 26 Nov 2013 by rpocc. Sorry, but English version of this review is unavailable due to significant size of text to be translated. You can read about this great module suite here. This is a fragment of 3-voice part made with Turing Machine and recorded to single track. 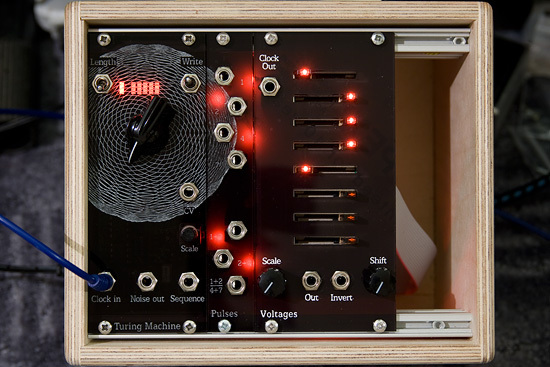 This entry was posted in Reviews and tagged eurorack, Music Think Modular, Thonk, Turing Machine, demo, modules, reviews, DIY on 25 Nov 2013 by rpocc.